A logbook, a pen, and a distracted receptionist—how many times has this been your first encounter when visiting a business? Every day, millions of business visitors are greeted by this archaic sign-in process, even those at highly secure or tech savvy organizations. Every day, millions of companies lose opportunities to capture and store actionable visitor data that can help them build relationships. Visitors come and go. The logbook fills up and gets filed away. Visit data gets buried for good. Sometimes, innovation starts at home. Traction on Demand, a leading software consulting firm in Canada, wanted to improve the way they greet and register their own visitors. As the largest Salesforce partner in the country, Traction naturally looked at a business visit as an event in the lifecycle of a relationship. Whether a visitor is an existing customer, a prospect, a partner, or supplier, Traction wanted a way to track the visit and store it alongside existing CRM data. Traction envisioned and built a visitor management application with data collection, security, and cloud service integration at the forefront. After piloting the new app in Traction’s own lobby and at several events, one of their partners, DocuSign, wanted to try it out as well. Thus, a product was born. Traction Guest provides the automated registration features that you’d expect, such as guest arrival notifications and badge printing. But it goes well beyond this. The app’s easy-to-use admin console and workflow editor allows facilities staff to create a branded, welcoming experience that is customized to their company’s needs. Native integrations with cloud platforms step it up even further. 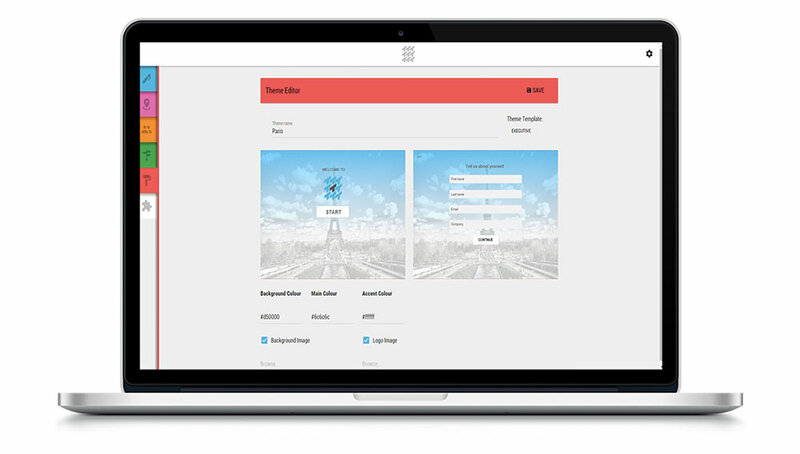 Traction Guest captures and funnels visitor data into the company’s Salesforce instance. Legal document signatures, such as on mutual non-disclosure agreements (MNDA), becomes a breeze thanks to DocuSign. Enterprise-grade security ensures that data is handled and stored safely in the cloud. The Traction Labs team had started using the Heroku platform a couple of years prior to their Traction Guest project. Heroku allowed the company to offer more flexible solutions to Salesforce-centric clients who wanted to build apps that went beyond what Force.com could do for them. With Heroku, they could build rich, user experiences and more easily package an app solution for clients that required little to no operations support. As Heroku is a part of the Salesforce Platform, clients were even more receptive to running their apps on Heroku. When the Traction Labs team needed a platform for Traction Guest, they naturally turned to Heroku. As the team was already so comfortable with the platform, it was their first choice for prototyping and getting iterations up and running quickly. But as development proceeded at such a fast pace, before they knew it, the team was well into making the actual product. They thought, "Why reinvent the wheel?," and didn’t consider any other solutions. Traction Guest is made up of three applications running on Heroku: the web app, which powers the admin functionality and API, the mobile app running on the visitor iPads, and a bare-bones front-end app. They use Ruby with multiple buildpacks for the back-end, AngularJS and LumX for the web app, Cordova for the mobile device app, and Sinatra for the front-end app. A range of Heroku Add-ons round out their implementation, including: Heroku Postgres, Heroku Redis, SSL, SendGrid, Deploy Hooks, Heroku Scheduler, New Relic APM, and Papertrail. Traction Guest integrates with Salesforce, DocuSign, Google Drive, Active Directory, and Slack. In Salesforce, Traction Guest enters new people as leads, and logs visits with existing contacts on their record. The app also sends notifications to the Salesforce Chatter feed, so an employee host can be immediately alerted of their visitor’s arrival. 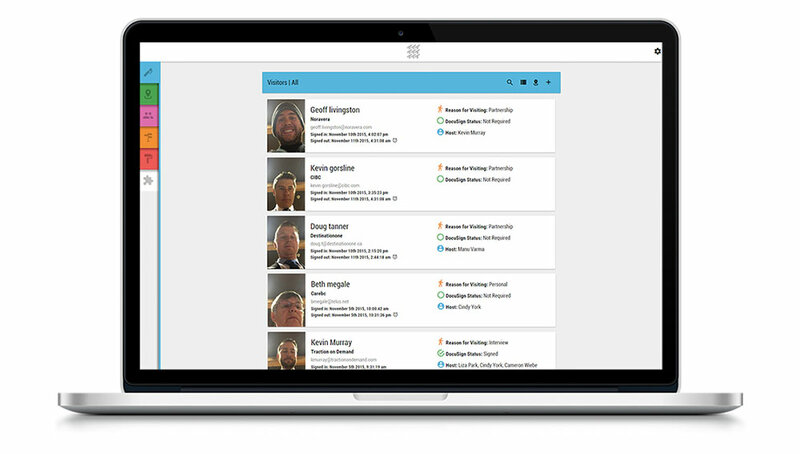 Traction Guest launched to the public in the summer of 2015, starting with a customer advisory board. The company invited some of their previous enterprise clients to start using the product and provide feedback. In the meantime, the development team is focusing on iterating the product and building a roadmap for its future. During sales calls, technical customers occasionally raise concerns about Traction Guest’s security or ease of roll out. To help close the deal, the sales team then cites Heroku’s benefits and market leadership to back up their product claims, especially for enterprise customers. Traction Guest serves three primary customer types: facilitators (reception and facilities staff), visitors, and employee hosts. The Traction Guest administration console is designed for non-technical staff, such as reception or facilities managers. 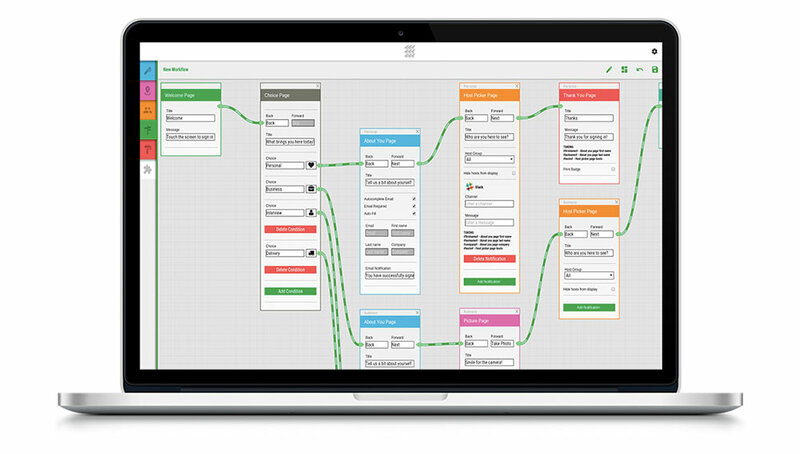 The simple interface walks the user through creating a visit experience flow. Each screen and step in the process can be configured to fit a company’s unique needs. The visit experience can be easily rolled out across multiple office locations and localized as needed. 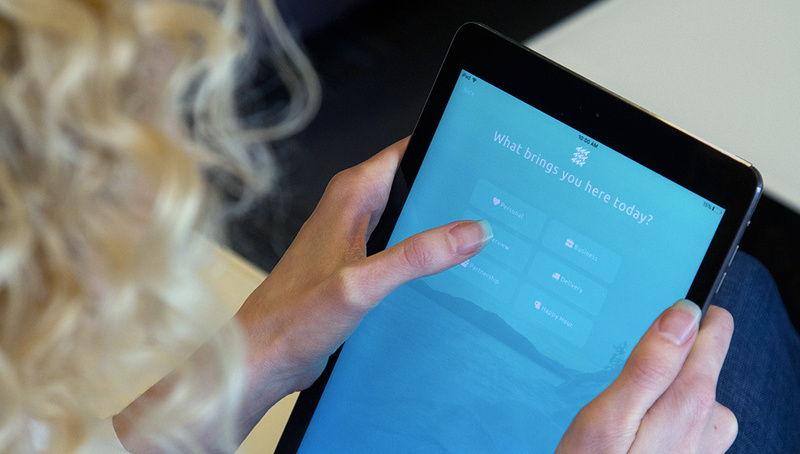 Visitors are greeted with a sophisticated, branded app running on an iPad in the company’s reception lobby. The visitor engages with a registration flow that includes information entry and may include taking their photo or requiring them to sign a legal document, such as a non-disclosure agreement. Return visitors are greeted as such and not required to re-enter information or re-sign legal documentation. Once registration is completed, Traction Guest can trigger a badge printer. Employee hosts no longer rely on a phone call from reception or other manual processes to be alerted to the arrival of their guest. Traction Guest can automatically send a notification to the visit host via email, SMS, or Salesforce Chatter. After the visit, hosts can access visit data through Salesforce. Traction Guest transforms visitor data from obsolete record to live company asset. Are you building an app that funnels customer data into your Salesforce instance? Traction on Demand chose to run their visitor management app on Heroku due to its reliability and performance. For more information, contact Heroku today. 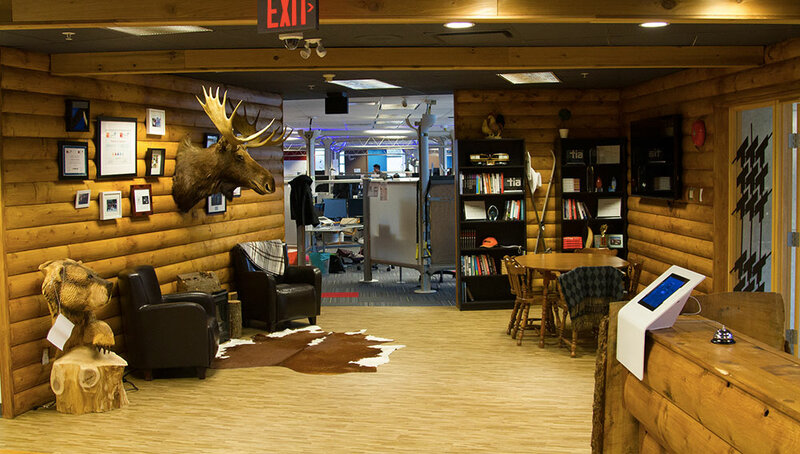 Based in Burnaby, BC, Traction on Demand is a consulting and software development firm with expertise in Salesforce.com implementations, data quality and marketing automation. By removing barriers to success, Traction ultimately increases their clients’ bottom line through sales, marketing and operational alignment. As a Salesforce Platinum Partner, the firm has grown to become the largest dedicated Salesforce consulting group in Canada. As of 2015, Traction has worked with over 800 companies, more than half of the 25 largest global technology firms, and has been involved in over 2500 Salesforce projects. Traction Guest is part of a portfolio of products created by the company’s Traction Labs. For more information, visit tractionondemand.com and tractionguest.com.